Across the team here at BlockSparks, we have been actively working with social media for business clients for many years. Since those early days of low adoption punctuated by frequent appearances of the ‘fail whale’, we’ve seen the platform grow to the essential global communications tool it is in 2018 by retaining its basically simple functionality: whilst we might have double the number of characters to play with, the underlying idea of sharing your thoughts with the world in a pithy statement which can be tagged, shared, followed or liked, has become a universal unit of conversational currency. This very simplicity has however led to a plethora of apps and tools to extend and automate Twitter messaging, for a variety of purposes and end goals. And nowadays we all have to acknowledge the role of social media messaging in shaping the global conversation and influencing world events. Those who make the messages have great power, and through exploiting the automation of this, they control the agenda. Public awareness of the impact on this is growing by the day, and Twitter’s own published data indicates that over 700,000 people were exposed to Russian propaganda from more than 50,000 automated bot accounts during the run-up to the 2016 US presidential election. So Twitter is fighting back, and making changes to its API to limit the ability of users to perform co-ordinated action across multiple accounts. From 23rd March 2018 there is a ban on making duplicate/repeated posts (which include ‘substantially similar’ content), and also on posting multiple updates over a short period (ie with intent to manipulate a topic or hashtag). 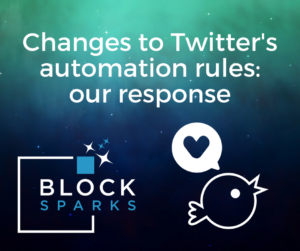 It is encouraged to retweet original content, rather than repost it – however “bulk, aggressive or very high-volume automated retweeting is not permitted” – essentially, anything which smacks of automation is out. The sole exception is for emergency announcements like tsunami warnings, from legitimate sources. This has implications for a great many applications used by perfectly legitimate businesses to manage their social media with efficiency, not seeking to subvert the democratic process in any way, merely to share their latest blog post across several accounts or set up reminders to an event or publication. And many people operating within the blockchain space are dealing with very fast moving conversations and changes, as well as being inclined to application-driven automations and efficiencies by nature. It’s not surprising that people are concerned about how their accounts will be affected, especially if more than one user is posting to them, not to mention using different third party applications. Naturally our consultants do use tools to streamline their workflows and curate content to be shared, but we are careful to choose professional and high-quality applications which are fully compliant with the new constraints. We keep a close eye on all the updates from the social platforms themselves, so that you can focus on what you do best: creating the products we’re socially marketing on your behalf. Whether or not we’re managing your account for you, don’t be surprised to see follower and following numbers dropping off over the next few weeks, as Twitter continues to actively purge thousands of bot accounts – as they often closely mimic real profiles and patterns of behaviour, it’s more or less inevitable that some wind up in every legitimate stream in the end. And if you have any questions or concerns about managing social media for your blockchain related business, please don’t hesitate to get in touch and talk to us about it. 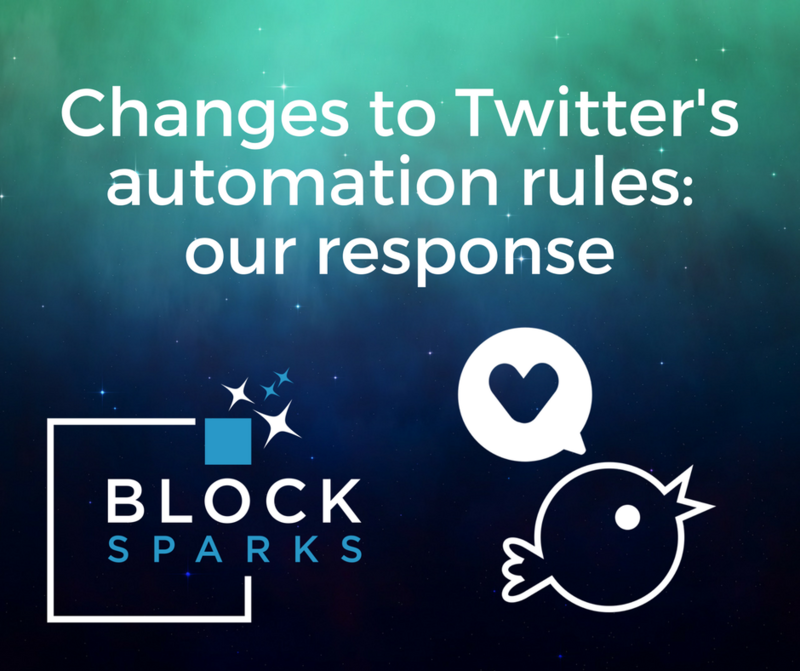 Tweet us @BlockSparks (if you’re not a Russian spybot!) and let’s start a conversation.